This Cuisinart model creates one and a half quarts of frozen dessert per batch and is capable of making back to back recipes. The housing is brushed stainless steel and the mixing bowl is created from anodized aluminum. The commercial style compressor freezer eliminates the need to chill the bowl before beginning. The temperature control allows precision mixing. The device includes an automatic sixty minute timer. The lid, paddle, and mixing bowl remove for hand washing. None of the parts are dishwasher safe. An instruction/recipe book is included, along with a three year limited warranty. With this unit, you can prepare frozen drinks, frozen yogurt, ice cream and sorbet. The lid is see through and includes an ingredient spout, so you can watch as the ice cream forms and add nuts, candies or other ingredients without stopping the machine. Each batch takes thirty to sixty minutes, depending on desired consistency. People really believe in Cuisinart ice cream machines and this one is another hit. Even though there is no need to chill the bowl, for better results you should chill the mixture. This can also cut down on time between batches. The machine can run a bit loud at times, but it isn't excessively noisy. With the thrill of making your own frozen delights, you'll hardly notice. 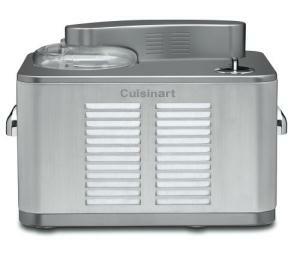 Also see the Mix-It-In Ice Cream Maker by Cuisinart.